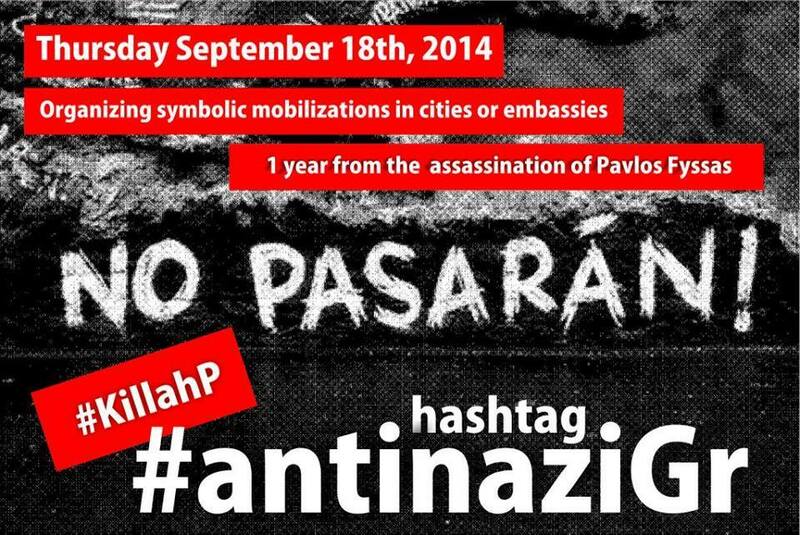 On Thursday the 18th of September @ 7pm, AAfG will be joining the International Day of Solidarity for the 1 year from the murder of Pavlos Fyssas.Rapper Pavlos Fyssas with a strong antifascist and antiracist sentiment in his lyrics, was murdered by members of the neo-nazi group ‘Golden Dawn’ on the 18th September 2013. Join us in giving a powerful message against the rise of fascism and racism. From our neighbourhoods, to the whole of Europe there is only one message to those who thrive on fear: NO PASARAN! Also on Sunday the 21st of September, AAfG in cooperation with Defend The Right To Protest will be organising a fundraising music event. More details to become available soon.